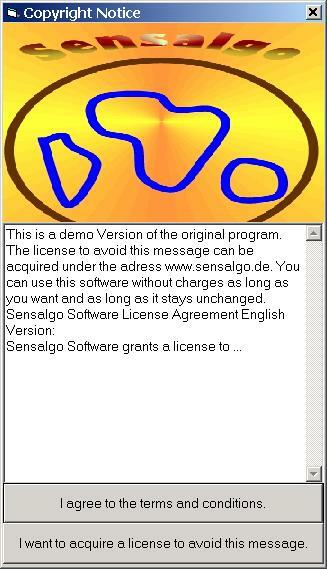 SenCopy protects programs and components, for example ActiveX, given out for shareware purposes by displaying a copyright message window. The window typically informs the user about the following: Who has developed the program / component, a limitation of liability, a forbade of distribution, that the program is a demo version until the appropriate key is entered. Besides informing the user the message window cripples the version, for the user has a little bit of effort to handle the window. Nevertheless you do not need two versions for one program or component, a full and a demo version, for a simple registration mechanism makes the demo version a full registered one. Both the window and the form and frequency of appearance can be customized by the attributes of this component. The key for a single or a group of computers is provided by a registry file sent to the user by mail for example. A special program named 'KeyGemo' performs the task of creating and storing these keys that are special for every customer and every kind of program. While SenCopy is Freeware, KeyGemo has to be purchased. Professional version control and software configuration management for Windows. Fully integrated with Windows Explorer and provides the most powerful and intuitive solution on the market today. Free for single users and open-source developers. This site does not contain serial number, crack, keygen SenCopy ActiveX serial number : serial number is the simplest type of crack. A serial number(cdkey,product key,etc) is register the program as you may already know. a crack or keygen may contain harmful software. If you cannot find the exact version you want, just give it a try. for more information read .nfo/.txt/.diz file include in zipped file.